BBC NEWS | UK | England | West Midlands | New name for Wispa bar? New name for Wispa bar? Chocolate maker Cadbury is thought to be planning to rename its Wispa bars. The Birmingham-based company is understood to be replacing the brand, which was first launched in 1981, with a bar called Dairy Milk Bubbles. 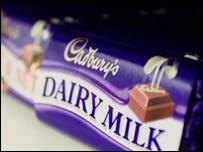 According to trade magazine Marketing Week, the decision is part of wider moves by Cadbury to bring more of its bars under the Dairy Milk name. The report claims the replacement for Wispa will be in shops by August. The Wispa product range includes the original milk chocolate bar and Wispa Gold, Wispa Mint and Wispa Bite. A spokesman for Cadbury, which also makes Flake, Double Decker and Milk Tray, refused to be drawn on the report. "Speculation is something we don't comment on," he said.